Following a successful anti-fluoride campaign in Canada, Dr. Paul Connett, Professor of Chemistry at St. Lawrence University in New York, visited the Infowars.com command center in Austin, Texas, to make appearance on the Alex Jones Show and tape "Deadly Fluoride: Hoax on the Run!" Connett was in town to make an appearance before the Austin City Council and argue in favor of eliminating the dangerous neurotoxin for Austin's water. Dr. Connett, who is the Executive Director of the Fluoride Action Network, is largely responsible for raising awareness to the dangers of fluoride in Canada. 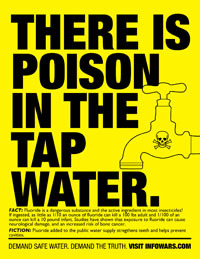 Earlier this year, the Calgary city council voted 10-3 to remove the toxic substance from the city's drinking water. Connett is attempting to repeat this success elsewhere in Canada as well as in Austin, Australia, and New Zealand. During the interview with Alex Jones, Dr. Connett presented in concise fashion overwhelming evidence of the health risks posed by water and food fluoridation.